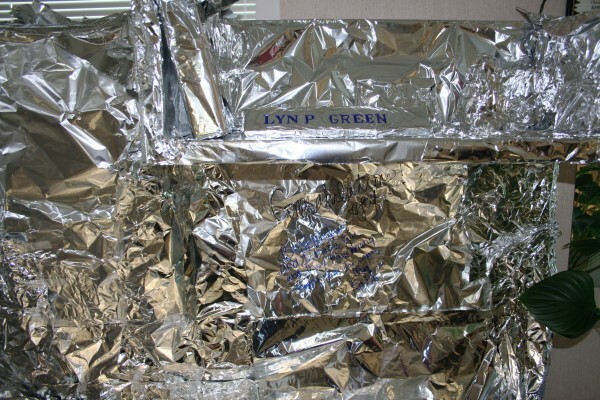 Wordless Wednesday: Foiled Again! An Office Prank to Remember - JP loves LIFE! Have you ever pulled off a highly visual prank? LOL I’m imagining someone coming back to work and having to unwrap her desk! 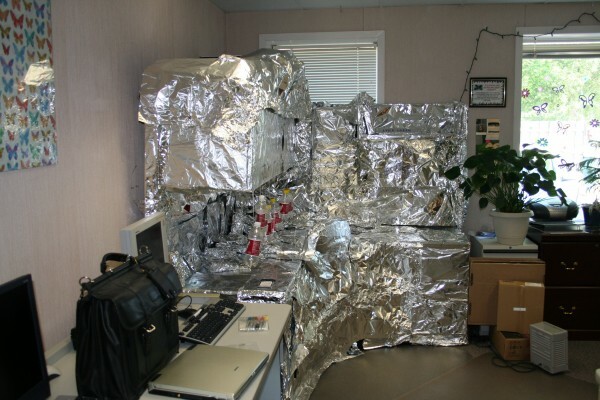 My hubby bubble wrapped his co-workers desk once at HP years ago, but this takes the cake! 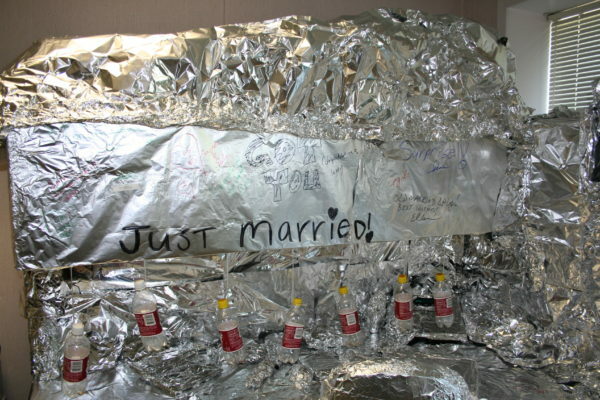 Amazing what you can do with foils. Wow! Usually we just put a creative desktop image on their computer. The Ogre and I were made into pirates when he proposed on a trip to Arizona. How fun! Love a good prank. The outhouse door was slightly open, and when people saw it, they could not resist the temptation to pull open the door of the little building to see what was inside, setting off the trap. The walls of the building flew in all directions with a loud “bang” from the trap. A colleague who had just returned to work after heart surgery entered the office. His eyes were fixed on the building. His path was direct. I looked up so see him on a beeline for my “trap shack.” (Envision this in slow-mo.) He’s moving toward the shack. Upon realization of pending potential disaster, I bound from my chair to stop him from pulling the trigger. With my arms extended, I shout, “Jack….nooooooooooo!!!!!!!! !” Too late. LOL! You did a great play by play on that one Max! Love it… I could hear the “nooooooooo!!!! !” in slow motion too! It was as if I was seeing the video! I can only imagine how much Jack got to laughing!